A few days ago, a writer friend, Lia Keyes, posted an article she’d read in the New York Times, about a Monet painting whose ownership is in dispute. At the time, she said she’d love it if someone would write the story. I printed the article after reading it and promptly forgot about it. Last night in bed, I read Katherine Mansfield’s short story, The Garden Party. As soon as I turned off the light I thought, I should add “The Garden Party” to my list of possible titles for short story ideas. I attempted then to fall asleep. But it was not to be. Claude Monet appeared in a garden in Giverny, talking with a young girl in hat of straw dyed black. (In Mansfield’s story, much is made of a black hat with black velvet ribbons.) After the light was turned on several times, to scribble sentences on a post it pad, I realized I should get up and write the story otherwise I would forget by the time morning rolled around. 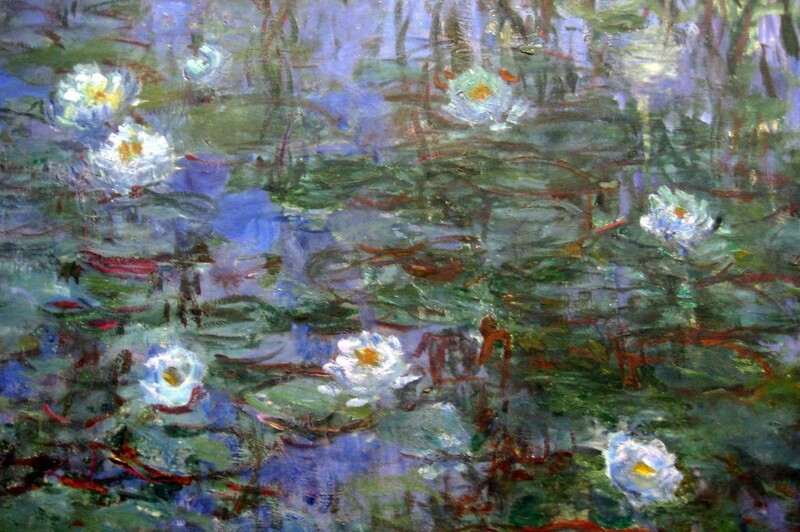 The upshot was a short, short story, flash fiction, really, under 500 words, of how Claude Monet came to paint his famous water lilies. This morning, clearing the table of printed papers for breakfast, I came across the article about the disputed Monet painting and realized *this* was the reason Claude Monet paid a visit to my imagination last night. It was at a garden party in Giverny that Claude Monet caught sight of the girl. She was wearing a straw hat, dyed black, which was out of keeping her with dress, though it was lovely in itself. There was something familiar about her, Monet thought, though he was sure they had never met. Mademoiselle, wait up a moment. Please. He called out as she walked ahead. She turned, and he saw, her eyes were the colour of sky, her lashes the darkness of sea. Her skin was the delicate cream of water lilies in bud. Why do I know you, Mademoiselle, when we have never met? The girl smiled, and her hat was carried away on a nearby cloud. Now her hair was unadorned except for stray lights of gold and silver that wove a diadem of sunlight over her brow. Her dress was a river of flowers on leaf green boats. Come, Monsieur, I will show you. Take my hand and you will see how you and I first met. In the garden ladies strolled talking of Michelangelo. The tinkle of tea cups and laughter in the summer air mingled with the fragrance of lavender and rosemary, honeysuckle and sweet pea. But none of these things, which normally were of great interest to Monsieur Monet, could pull him away from the girl with the outstretched hand. He took it, not caring who saw. He wanted to paint the beauty he felt, because of her. And yet it was not her beauty he wanted to capture, it was something else. Something he could not yet grasp. But he knew she would show him, and it would be stupendous. Her hand was surprisingly cool. She led him to the great pond beyond the marquee where later a band would play, and couples would dance in the luminous night. The pond was as still as silver-lined glass. It reflected her image and he understood. The girl by his side was a water nymph. The pond was her home. The lilies were hers. Her dress would be one with the water as soon as she stepped into it. It was made of the same magic that had reverted to stars Cinderella’s ball gown at midnight. So it was, Claude Monet painted his water lilies—her water lilies—and in years to come people marvelled at his ability to capture the tranquility of the pond, the incandescence of the blooms, the translucence of sky and cream colour clouds. But they never caught sight of the nymph with a diadem on her brow. Or a black straw hat on a nearby distant cloud.